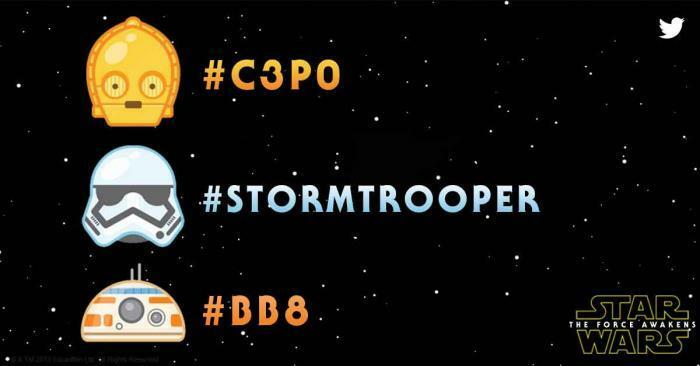 The Star Wars Celebration kicked off on Thursday, and Twitter is getting in on the action with a special batch of Star Wars Emoji. Thanks to a partnership between Disney and Lucasfilm, you can know tweet adorable little pictures of C-3PO, a Stormtrooper, and even the new BB-8 droid. To use the new Emojis, just tweet one of the hashtags listed above and it will show up automatically. Twitter has done something similar a few times before, even adding national flag Emojis during the World Cup last summer. Now you can use the same feature to fill your timeline with Star Wars characters instead. We’re limited to just three options for now, but Twitter says there are more coming soon. We can’t say we’re surprised. After all, the new Star Wars film is still a long ways away, and there are plenty of other characters, ships and items to choose from. We’d love to see a Millennium Falcon, a Darth Vader head or even a lightsaber soon, though there’s no telling when the next batch of Star Wars Emojis will arrive.